THE INVESTOR BEHAVIOR PROJECT AT YALE UNIVERSITY, under the direction of Dr. Robert Shiller since its beginning and now under the auspices of the Yale International Center for Finance, has been collecting questionnaire survey data on the behavior of US investors since 1984. Among the studies that this project has produced was a major study of investor thinking about market valuation. Confidence in acceptable valuations of the market was held by over 60% to 80% of the surveyed population from 2001 through 2011. That has changed early in 2013 when the confidence level of investors that that the market was not too high dropped to 45% to 50%. 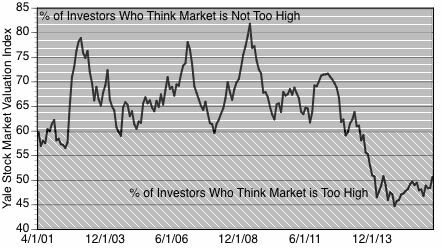 CONCLUSION: From 2001 to 2011 60% to 80% of investors accepted high valuations of the market - e.g. market was not too high. After 2013 only 45% to 50% of investors accepted market valuations - e.g. market became too high.